Davide Squillace is certainly not one to rest on his laurels; the Italian DJ/Producer has a potential claim to being one of the busiest artists in electronic music. Each year that passes sees Davide increasingly adding to his ever-expanding repertoire and range of creative projects. As he says: “for me, the best year will come from how I feel about it in retrospect. It’s important for our team to stay interested in what we are doing and remain proud of our work.”It’s been non-stop ever since Davide finished studying at the Naples School of Sound Engineering and left his hometown for Barcelona in 2004. Having relocated to southern Europe’s creative hub, Davide soon began touring the continent whilst releasing a huge body of productions across a wide range of respected labels; Ovum, Saved, Sci+Tec, Desolat, Get Physical and Supernature to name just a few. During this prolific period, he even founded his own labels: Sketch, Minisketch, Hideout and Titbit. It wasn’t long before Davide was picked up by infamous Ibiza institution Circo Loco, making his residency debut in 2007. Over 10 years on, he remains an integral part of the family to this day, continuing to regularly play for the tastemaking parties both at its DC10 home and on the Circoloco tours. More recently, Davide has also been touring with Matthias Tanzmann and Martin Buttrich as one third of Better Lost Than Stupid, with rumours of an album in the pipeline. Davide and Matthias had regularly played together before at DC10, but it was at an incendiary back-to-back session with Martin Buttrich at Electric Zoo in New York where the idea for Better Lost Than Stupid first came about. 2012 was a landmark year for Squillace - having produced a seminal BBC Radio 1 Essential Mix, Davide went on to launch the unique This And That Lab. A fusion of artistic think tank and record label, This And That is a platform for Davide and other like-minded artists to develop creative projects in music, visual art, design, fashion and writing. Davide regularly enlists the help of inspirational artists for cover art, and there have also been collaborations with sculptors, videographers, shoe designers and jewellery makers over the years. One such example of Davide’s forward-thinking approach to consolidating music with the visual arts is his collaboration with Country of Milan owner Marcelo Burlon. A huge fan of the fashion house, Davide “was buying everything from him he could find”. Burlon eventually reached out to Davide having followed his social media - a DJ himself, Burlon invited Squillace to his atelier and Squillace invited Burlon to his studio. The result was a single release, ‘Gaulicho’, and a limited edition run of T shirts and bracelets. A sophisticated but atmospheric offering, 'Gualicho' showcases Davide's ability to craft mesmeric techno that maintains the soul of Burlon's iconic artistry - with the release also forming the soundtrack to Burlon’s women’s show in Milan. In Davide’s words, “It’s all about synergy with different people through various mediums—a creative process that everyone can emotionally grow from. It's passion.”A further manifestation of Davide’s joint artistic and musical projects is Blender, a brand new events concept that was debuted at 2015’s Art Basel. The idea of each Blender event is to record data taken during the night to be mixed and processed to create a three-dimensional artwork. The ‘data’ of the night effectively stems from the music of the live set as well as the sounds of field recordings, the volume of people as well as the temperature of their bodies, resulting in a unique, tangible testimony of each event. Meanwhile, Davide continues to tirelessly expand on his production repertoire with releases on the likes of Cadenza, Kaoz Theory, No19, Moon Harbour and Hot Creations. 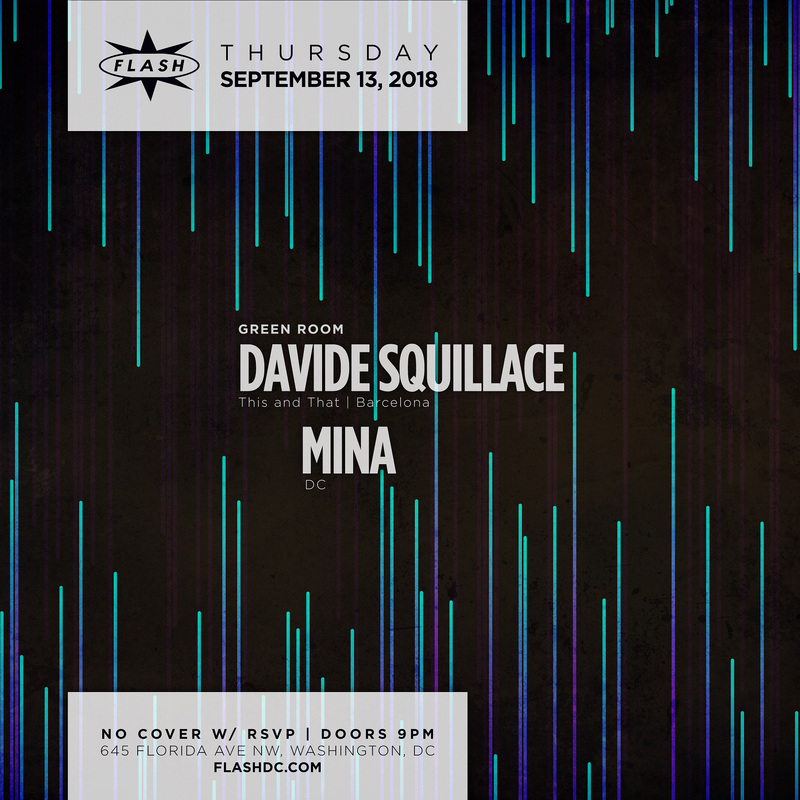 Davide Squillace is clearly an established and internationally renowned producer and DJ, with touring and release credentials that speak for themselves. However, it’s his constant dedication to pushing the boundaries with a multitude of new creative ideas that marks him out as a true artist. With so many new projects and ideas in the works, it still feels like the beginning of even bigger things to come for Squillace.